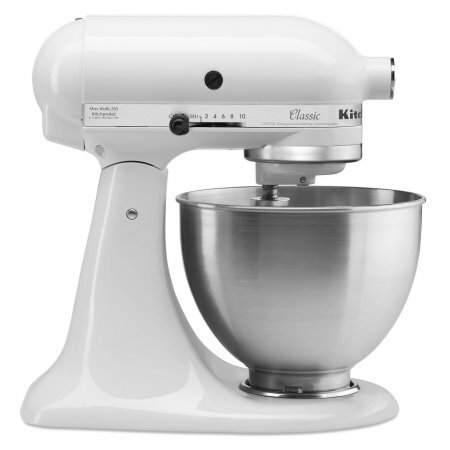 KitchenAid Classic Series 4.5 Quart Tilt-Head Stand Mixer $189 with Promo Code! Here is another great Black Friday deal for this KitchenAid Classic Series 4.5 Quart Tilt-Head Stand Mixer from Macys! Normally, even the sale price is at least $250, and the regular price is usually well over $300! But if you act fast, you can get it right now for only $189 when you use promo code DEAL! The KitchenAid Classic Plus Series Tilt-Head Stand Mixer with 4.5-quart stainless steel mixing bowl and 10 speeds easily mixes, kneads and whips your favorite ingredients. For even more versatility, the power hub is designed to use the motor’s power to operate optional attachments from food grinders to pasta makers and more. The 4.5-quart stainless steel bowl offers enough capacity to mix dough for 6 dozen cookies, 3 loaves of bread or 6 pounds of mashed potatoes in a single batch. The bowl is also dishwasher-safe for quick and easy cleanup. Includes everything you need for recipes with a coated flat beater, coated dough hook and 6-wire whip. The flat beater and dough hook are dishwasher-safe. Hurry over here to pay only $189 with promo code DEAL!